Erected by the brothers and sisters in loving memory of. Mary Levack died at Lybster 23rd January 1916 3rd daughter of James Levak. Brother Angus Levack died at Perry Iowa USA 23rd March 1915 eldest son. 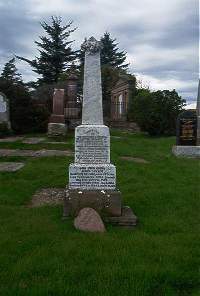 Brother Wemyss Levack died at Dunbeath 31st May 1880 in infancy. Father James Levack died 1st May 1922 aged 73. Sister Diana Levack, nurse, died 26th Febuary 1932. Mother Christina Mackay died 20th May 1934 aged 86. Small marble heart laid against bottom of grave stone.